I’ve upgraded to a 12.9” iPad Pro, so I’m selling my 10.5” model (256 GB, wifi, gold). It’s only seven months old, and in absolutely mint condition. 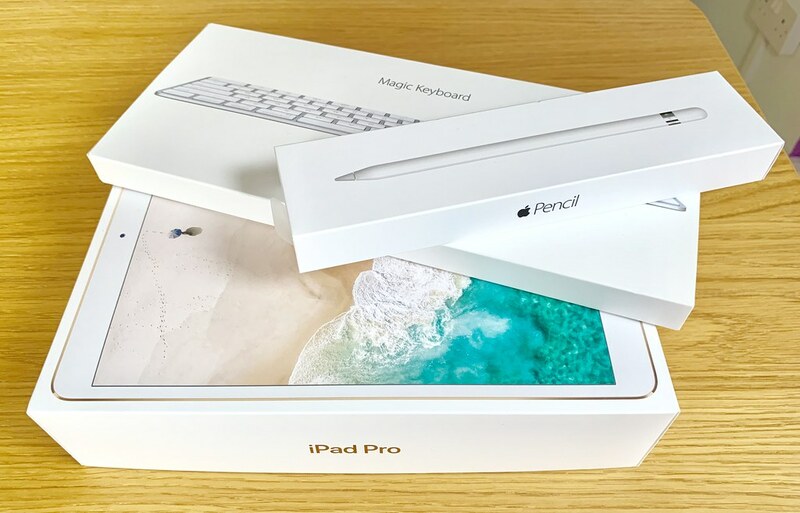 It includes an Apple Pencil (also mint condition), and a Magic Keyboard in perfect working order. All three items are boxed, and include everything they originally came with. The iPad has a UK-style plug, and the Magic Keyboard is the UK ISO layout. Additionally, I’m including a Studio Neat Canopy stand, three different cases/covers, an Apple Pencil stand, and a case for the Pencil (both accessories can charge the Pencil). I’m looking for about £700, plus shipping (or you can collect from Edinburgh). If interested, please fill in this form. Here’s a gallery of photos of all the stuff! Running the newest version of iOS 12 at time of writing. Fully functional in every way. No problems or repairs. Originally purchased in June 2017, and replaced with a brand new model under warranty in April 2018. In practically-new cosmetic condition. Screen is perfect. Back is pretty much perfect too. Boxed in the original packaging. Includes everything from the original box: iPad Pro, Lightning cable, charger (UK plug). Apple Pencil, boxed and in perfect condition. Includes everything: Pencil, Lightning adapter, cap, and spare tip (original tip is still fine). Apple Magic Keyboard, boxed and in great condition. Includes everything: keyboard plus Lightning cable. Still holds a great charge (way more than a month of use). A transparent TPU back-cover protector. It’s soft and flexible, and when it’s on, you can barely see it. Good if you want to keep the iPad fully visible, but with some protection. No packaging. A third-party purple Smart Cover for the iPad. No packaging. 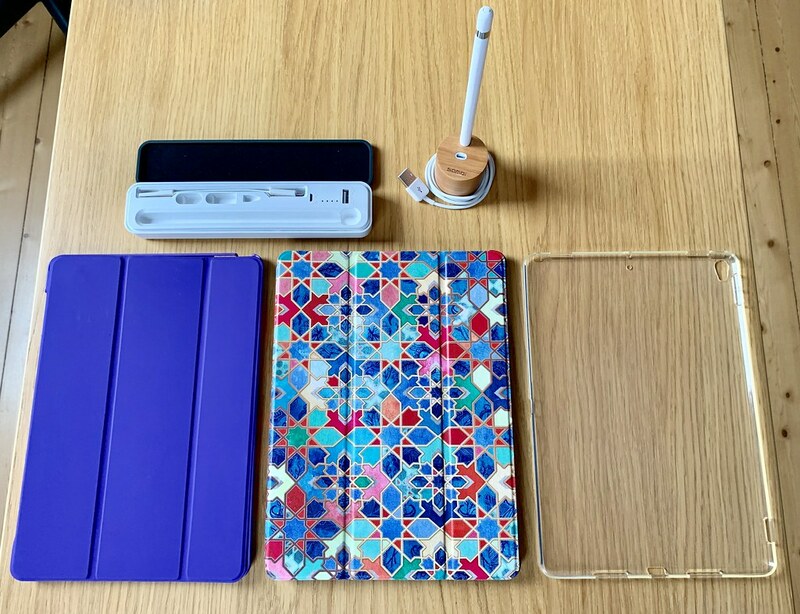 A third-party multicoloured Smart Cover for the iPad, with a slot to hold the Pencil. No packaging. A pot/stand for the Apple Pencil. When combined with a Lightning cable and the Lightning adapter included with the Apple Pencil itself, you can even charge the Pencil in this stand. A case for the Apple Pencil and its accessories. It has an internal battery and it can charge the Pencil. That’s everything. I’m looking for about £700 for the bundle, plus shipping. If purchased brand new, it’d all be worth over £1,000. If you’re interested in buying, please fill in this form. You pay the asking price plus the shipping cost, which we’ll work out later. I recommend a fully insured and tracked method, but it’s your choice. Payment will be via PayPal (or UK bank transfer), in advance. If you’re able to come to Edinburgh, you can collect it too. Note that demand tends to be high when I sell my unneeded devices, so it’s wise to add a maximum bid in the form too, but that’s entirely up to you. Thanks for reading! Once again, if you’d like to buy this stuff, please fill in this form.